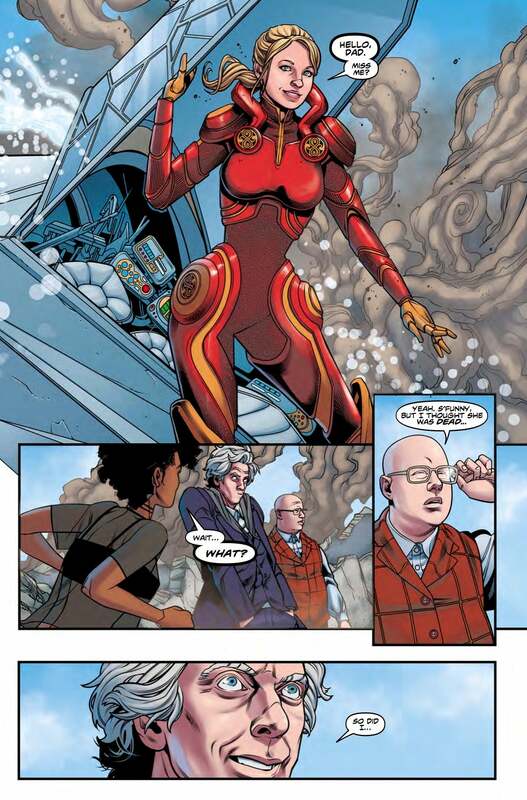 Over the past few years, Titan's line of Doctor Who comics has branched out into big, series-spanning crossover events, bringing the creative teams from its various Doctor Who titles together for months-long stories that unite both Doctors and companions alike. The most recent, The Lost Dimension, came to a conclusion last November, with the first half of the saga being collected in hardcover later this month. We recently spoke to the three writers behind it - Nick Abadzis, Cavan Scott and George Mann - to find out a bit more about what crafting a story with so many Doctors, and so many companions, is really like. "Cav and George had worked together before, and they were very gracious and generous in welcoming me into their established writing partnership," Abadzis told us. "We all have different approaches to writing, but our intentions and goals are very similar, so it gelled easily." Abadzis started by sketching out a massive brainstorm of ideas about how to unite not just the four "modern" Doctors that Titan's books usually follow, but every incarnation of the Time Lord we've met so far. "I'm a cartoonist as much as a writer, so I tend to map things out visually, doodling all sorts of elements, be they plot progressions or characters, and rearranging them along a visual timeline to try and get the best pacing and emotional turning points into a story. I sent Cav and George a big map of some of the ideas we were all putting into the mix early on - I think they thought I was nuts! We had a good laugh about it. Some of those things made it into the overall final storyline." According to Mann, even though this is the first time all three of them had worked together on a Who book, the process went smoothly. "It was a lovely melange of ideas, from three hoary old Doctor Who fans still very much in love with the show. It was great that we were all able to trust each other so quickly, and all felt very much at ease throwing in ideas (some of which were very outlandish). That melting pot formed the basis of a really strong narrative, I think, and it's great that we all contributed ideas that made it right through to the end. It's very much a team effort." 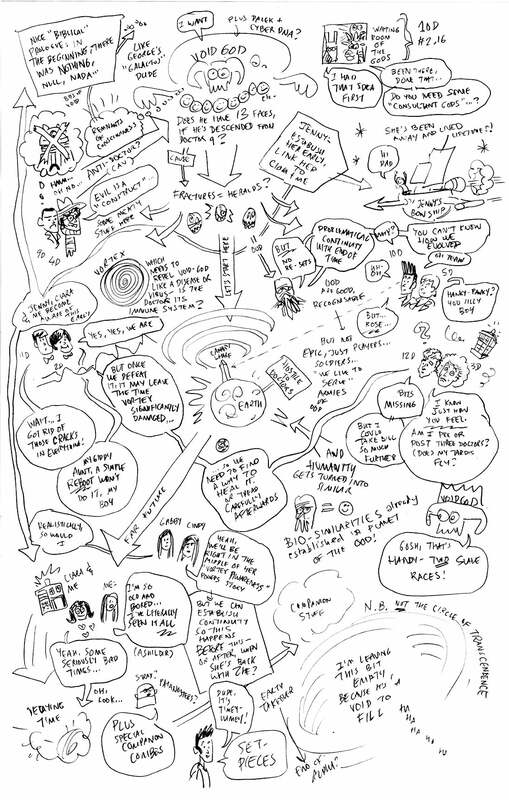 Abadzis' full brainstorm plan for The Lost Dimension. Although the process behind the earliest days of The Lost Dimension went smoothly, the team did have one slight problem, albeit geographical rather than creative - two-thirds of The Lost Dimension team were based in Doctor Who's ancestral home, while Abadzis was a literal ocean away in New York. "Cav and George both live in the UK," Abadzis continued. "So after everyone had agreed on the basic elements, they then took all our rough ideas and hammered them into a shape we could all work with." Scott and Mann would go through their ideas for the series in person. "I shot up the motorway to stay with George for a few days and we basically locked ourselves away to go through all the wish-lists," Scott told us. "[We'd] see what elements could be used and which had to end up on the cutting room floor. Once that was done, we could start piecing everything together, helped by numerous cups of tea and many, many slices of cake." "The cake was a key component. Definitely," Mann added. "We had a couple of very intense days, involving lots of frowning and staring at notecards with all the different elements on. By the end of it we had an outline. We wrote it up, pressed send, and then sat back thinking, 'No one's ever going to let us do that'..."
Some early ideas for the series didn't pan out. Lovecraftian icon Cthulhu was one early contender for the series' big bad. Another, the ancient Time Lord villain Omega (a recurring foe who previously united the first three Doctors for Who's first ever anniversary special, "The Three Doctors", in 1973), was scuppered because the rights to use the character weren't cleared before the team needed to start writing. The final version of the team's plan for The Lost Dimension would see the Doctors united to face a mysterious cosmic entity known as the Void, an empty hole tearing its way through time and space, consuming people and planets alike. 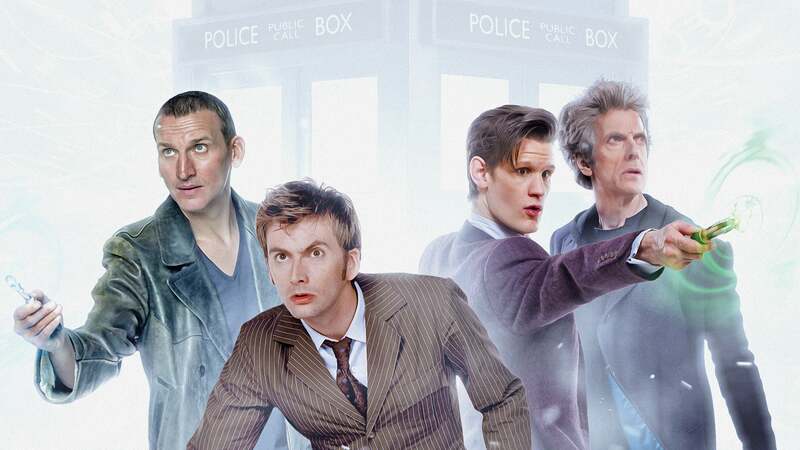 Although the Ninth, Tenth, Eleventh and Twelfth Doctors (the latter three of which all otherwise star in ongoing series of their own, outside of Lost Dimension) would form the backbone of the storyline with their companions - in the case of the Eleventh and Tenth Doctors, that would mean their comics-original allies Alice, Gabby and Cindy - the story would also bring back a character fans have spent nearly a decade waiting to see return to the series: Jenny, the clone daughter of the Doctor created for the 2008 episode "The Doctor's Daughter". Russell T. Davies, Doctor Who's showrunner at the time, has long said that the original plan for the series would have seen Jenny killed off at the end of "The Doctor's Daughter", but the character was ultimately saved thanks to an intervention by Steven Moffat, and sent off on adventures of her own... adventures that have occurred offscreen and unwritten, until her grand return for The Lost Dimension. "It was a real joy," Mann said of bringing Jenny back. "She's such a great character, and so loved, even after such a brief appearance on the show. And we had a lot of fun with her, having her react to the different incarnations of her 'dad', having the Ninth Doctor wondering what was going on, and having a scene where she interacts with the Fifth Doctor, and he doesn't quite catch her calling him 'Dad'..."
Jenny's return also included a design update. Gone were the olive green T-shirt and black combat trousers she wore on TV, replaced by a much fancier piece of gear. "One of my favourite things about Jenny's return was seeing Rachael Stott's incredible design for her new costume," Scott told us. "In the script, we simply described it as a 'Gallifreyan flight suit', and Rachael came back with the most beautiful suit of armour. And best of all, fans are already cosplaying as the new armoured Jenny. That's fantastic." Jenny wasn't the only throwback from Who's nearly 55-year history that the team got to play around with for The Lost Dimension. The Eleventh Doctor and Alice's arc in the story saw the duo flung into Gallifrey's ancient history, in a time before the great civilisation unlocked the keys to time travel. "I kept suggesting that we visit ancient Gallifrey somehow, Time Lock be damned," Abadzis told us, which lead to a plotline where the Eleventh Doctor and Alice discovered a prototype TARDIS, in the style of the grey tubes shown in "The Name of the Doctor". 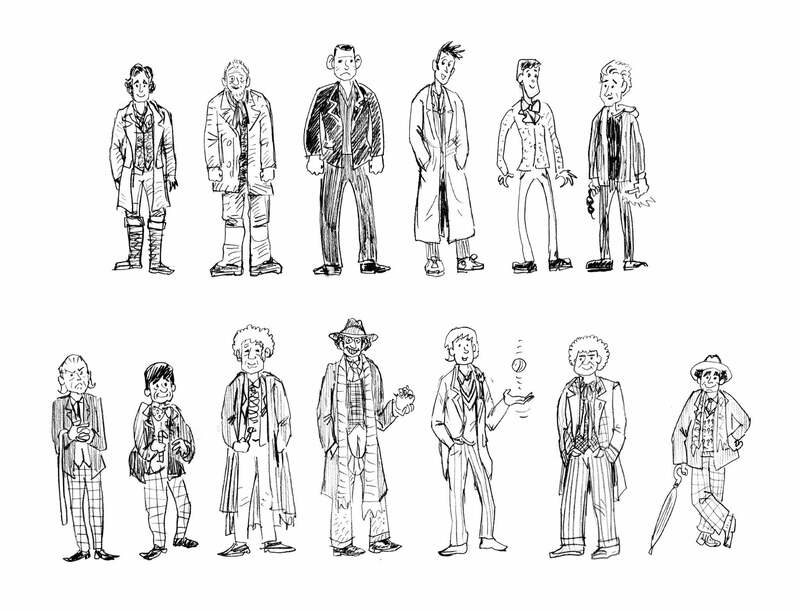 Abadzis' doodles of every Doctor... so far, at least. "[George and Cavan] worked in the plot element of the prototype TARDIS. I then took that and ran with it. That was a hell of a lot of fun to write. I thought it was important to give the story as a whole a sense of the mythic, of the widest canvas possible, as all multi-Doctor stories should." That mythic element of Doctor Who's vast history, Scott added, is what elevated The Lost Dimension for the team. "Doctor Who already has its own rich mythology, so we didn't really like the idea of grafting on someone else's." "I think this is one of the key things that sets Doctor Who apart from other TV shows - that massive mythology and history that's been built up in layers over the 50-odd years of the show's existence," Mann concluded. "It was important to us to try to encapsulate some of that in this series. For me, if you're going to make an event series feel special, it has to be about more than just throwing some Doctors together on a typical adventure. It has to have world- or universe-shattering consequences, and the best way to do that is to delve back into the established mythology of the show and create something from the riches you find in there. That's what makes it feel intrinsically Doctor Who, I think." 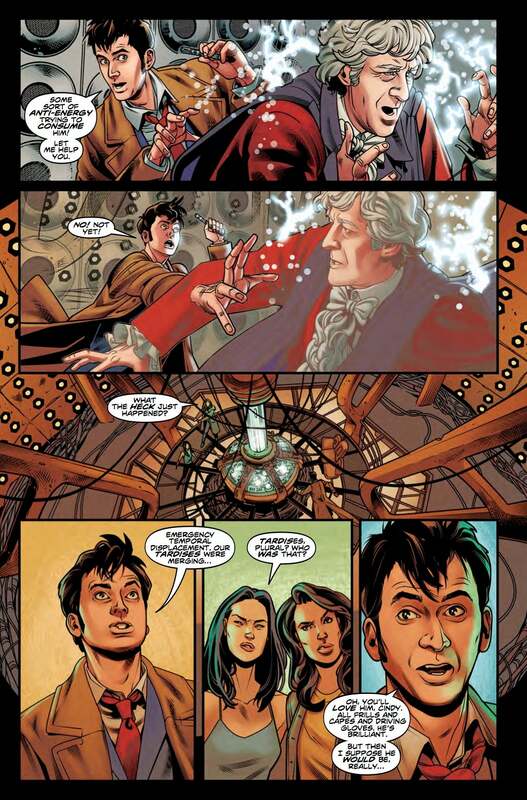 Doctor Who: The Lost Dimension Book One hits shelves February 20. Why are two of them wearing lipstick in the leading image?